While (re)reading Remembrance of Things Past, I’ve noted that the narrator (who has not yet been named but who will eventually be named Marcel) has mentioned having fought several duels over the Dreyfus Case. If you don’t know what the Dreyfus Case, I can’t help you except to say read a book and also to say that this isn’t a small part of history and you can see a historical precedent for the virulent, genocidal anti-semitism of the Holocaust and its enablers. But what struck me is how the duels themselves are glossed over. Until I remembered that, at this time, a duel was typically a fairly harmless affair. 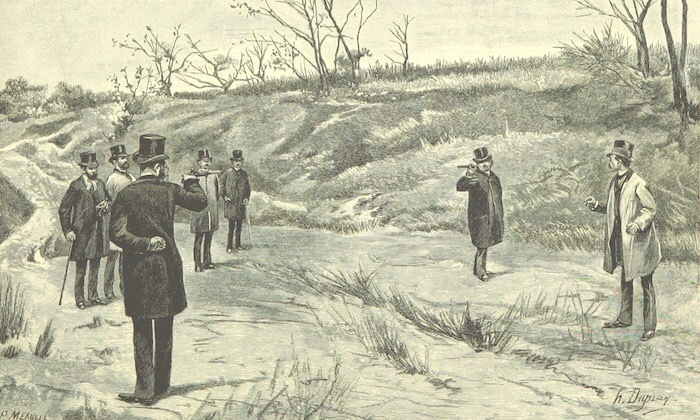 Usually, two gentlemen the would show up at the appointed place and time and fire their pistols harmlessly into the air, having proved their courage by appearing. Only rarely would the parties aim at each other or use swords (which would necessitate an exchange or two until first blood was drawn, at least). So, the duels were not described because the real danger would have been catching a cold in the early morning air. ← Paul Ryan Grew A Beard. Again. Apparently, This Is A Bigger Deal Than Climate Change.